The west Australian sky is an astonishing blue as we meander down the beach. 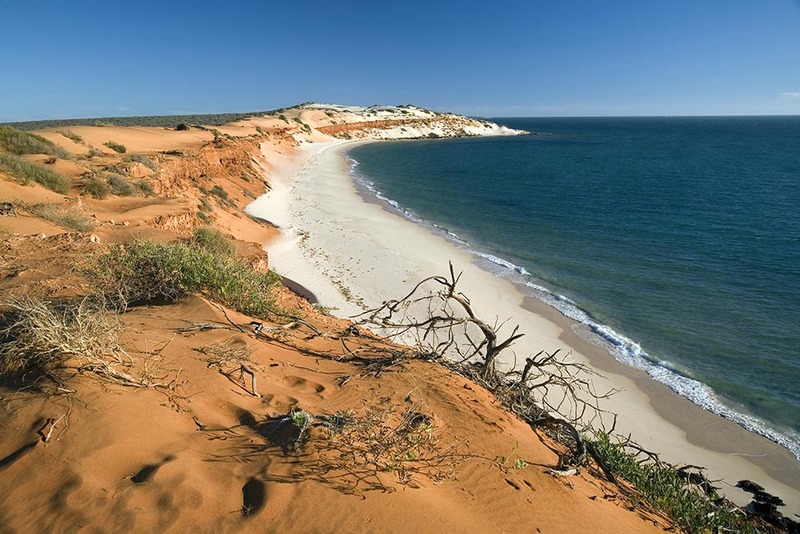 Rusty cliffs outline Shark Bay’s inkpad of turquoise and green water. Ahead of us, a dolphin has almost catapulted itself from the water and onto the beach. There is a rushing and splashing as two other dolphins flick their tails and twist along the water’s edge. The first dolphin rolls back into the water. Ahead of the group is the frantic panic of a mullet. 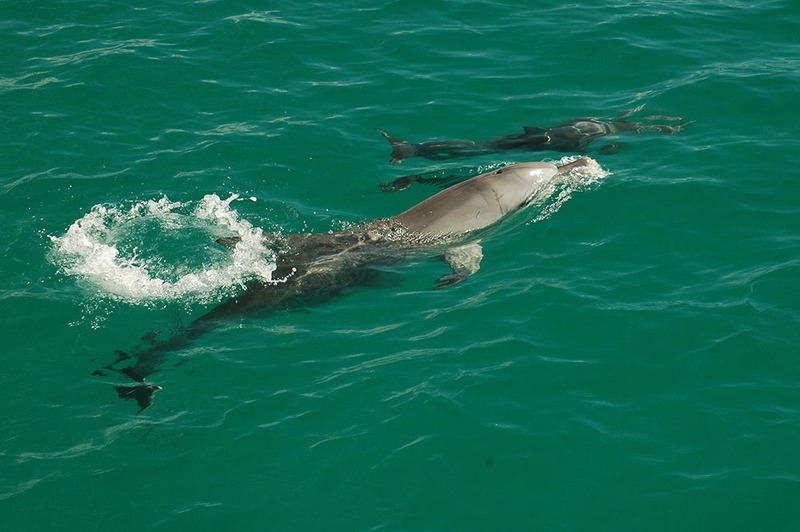 The dolphins close in, one of them appears to block the mullet’s escape route – a coordinated chase. Clicks and whistles of communication linger in the air. A flick of a dolphin’s head and the fish’s efforts at escape is over. The team of hunters slows to an amble and they cruise slowly close to shore. Bottlenose dolphins are masters of social networking. You may think Facebook is just for people but in fact, dolphins have been doing social networking at least as long as we have. Male and female bottlenose dolphins spend their days wooing friends and building close relationships. And such friendships are as critical to dolphins as they are to humans. Being able to get along with and to manipulate others is, say researchers, the difference between surviving and reproducing or failing at both. And such networking may be why dolphins, and humans, are also so intelligent. Research in Shark Bay, Western Australia is revealing the most complex social relationship found in any cetacean, and these insights may change the way we see dolphins. The bottlenose dolphins of Shark Bay live in a “fission-fusion” society just like us, defined by socialising in both large and smaller groups. It is a complex setup and relies on remembering information about individuals we don’t regularly come into contact with. For humans, distant communication such as letters, telephone and now email and Facebook help maintain our increasingly distant relationships and help us stay connected. Information is not always available about who is a friend of whom, and having to relearn detailed information about numerous individuals is energy costly. To cope with this, animals in fission-fusion societies associate in small groups that change in composition on a daily and sometimes hourly basis. It’s a fluid social setup and occurs in some primates, including humans. Animals that live in such societies depend on who is there and, as importantly, who is not. They have best friends and family members as well as others they associate with, and the number in a particular group changes over time. Like us, they may have disputes and disagreements. They have friends in and friends out, and more often than not, friends in again. And our similarities don’t stop there. Like us, males and females have quite different social lives. Males stay in so-called alliances (all male gangs) while females tend to form looser networks with certain females they prefer to be with. Because dolphins tend to stay in the area of their birth – a behaviour called philopatry, literally “love of place” – they are able to make lifelong friendships. According to researchers, keeping track of such complex relationships and being able to manipulate social situations requires a large brain and high intelligence. 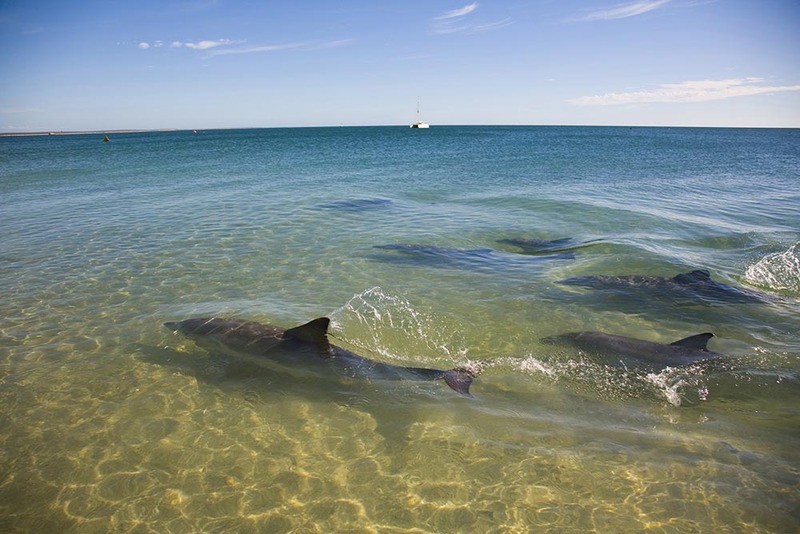 It has long been known that male bottlenose dolphins in Shark Bay team up to form alliances of two and three when it comes time to mate with females. These groups tend to be male friends that have bonds lasting years. Two well-studied dolphins, named Real Notch and Hii, cooperated in herding females for each other for 15 years. Females come into oestrus every four to five years, so males get little opportunity to mate. Alliances where males herd the females, apparently against their will, increase their chances of reproducing. Now there seems to be a higher-level alliance – a third level – where another group of friends will join in to help in the fight. These are highly sophisticated partnerships, says Connor, rarely seen, except in humans. And the need to keep track of such intricate and constantly shifting friendships and alliances may be why the bottlenose dolphin has such a large brain. These super alliances are confusing though: “These are rival males, not relatives; theoretically they should avoid each other.” But Connor suggests the dolphins may join forces because, in the future, they may need help too. The researchers have likened it to a soap opera. And it is not just the blokes that get together — females do it too. Human mothers often form mum and baby clubs, crucial networks of support and empathy. Celine Frere of the University of Queensland recently found that Shark Bay mums had much healthier calves if their friends had raised healthy calves. Frere looked at survival and found mums had calves surviving to at least three years old if other mums around them did too. “Their social relationships are really dynamic but they’ll have friends with whom they spend more time than others,” says Frere. It is this strong social behaviour that helps the mothers raise healthy calves. This may suggest the passing on of information between mothers. Other studies have found that mums associated with mothers, grandmothers and aunts who raised healthy young were more likely to raise healthy calves. The success is partly genetic but there are also social influences and this is the first time it has been clearly shown in a wild animal population. Frere speculates that dolphin mother’s help each other by keeping would-be attackers – such as sharks – at bay, and helping new mothers stay clear of dangerous areas. So maintaining such friendships is the key to survival. Researchers are increasingly convinced that it is social interaction and competition, rather than any technical requirements that have enabled dolphins, and us, to evolve such large brains. How did it happen then? According to Connor, “It’s unlikely a coincidence that humans and dolphins also have in common the largest brains, relative to body size, among mammals.” One of the reasons, says Connor, is that both dolphins and humans can afford large brains. They have a high quality diet and high metabolic rate so brain size is less costly. So what favoured the evolution of large brain size, given all dolphins and humans have very different environments and lifestyle? Their one similarity is their complex social systems. Connor argues that, despite any differences, there are extreme threats from others in their groups as well as from predators, and therefore the development of dependency (friendships and alliances) on each other was crucial to survival throughout the evolution of their lineage. Intergroup conflicts (office politics and family feuds, in human terms) would support this theory in humans and dolphins. We also know that predator protection is important for dolphin societies, and would have been critical for early human societies. Other schools of thought point to the highly complex use of sound in dolphins and humans as the prime cause for the evolution of a large brain. Humans have the largest brain to body size ratio and only humans have the power of language. According to researchers, language opened up a completely new arena for social manipulation. Imagine what advantage one can gain by being able to talk about others in their absence? Gossiping is a favoured past time of humans and passing on information, or indeed misinformation, to enhance social positioning is crucial in human society. It seems this lends further support to the social reasons our brains are so large. But what of dolphins, who as far as we currently understand, have no such language skills? Connor says that a lack of language as we understand it does not exclude complex relationships and gossiping. Bottlenose dolphins produce a baffling variety of noises or vocalisations; whistles, clicks, barks and pulsed sounds, the meaning and purpose of which have researchers largely in the dark. Bottlenose dolphin whistles have been studied most of all. All bottlenose dolphins have a signature whistle, a unique identifying name, and one that is used, it seems, to call others. They are used when animals are out of range, to call an individual back to the group. Pulsed sounds are more difficult to study but it is clear that they communicate affects. And combined with whistles, dolphins may indeed have a rich vocal repertoire bordering on language. As far as we know, gossiping may be as important to dolphins as it is to us. Whatever the truth behind the mystery of evolution and our large brains, it’s clear that we are closer to our aquatic cousins than we think. 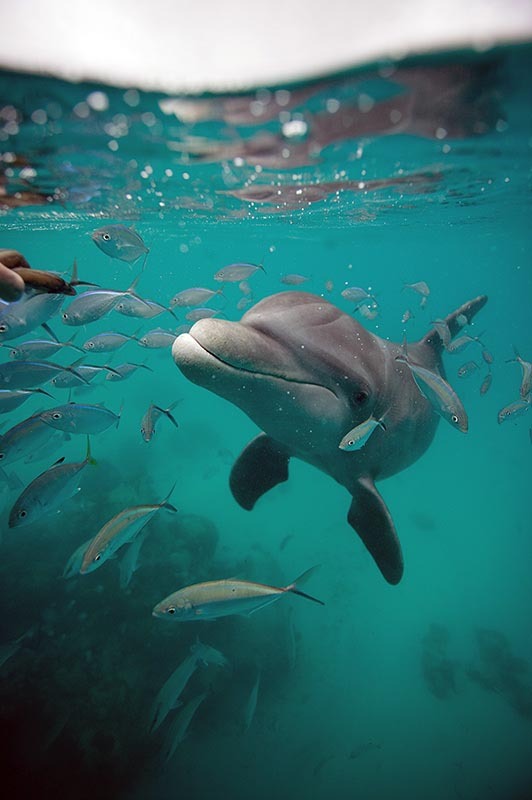 Humans and dolphins are species that have arrived at a similar level of social complexity along different evolutionary lines, and, in studying Shark Bay’s remarkable dolphins, we are learning as much about our own lives and our evolutionary history as we are about theirs.